"That's odd" Said a guest. "I don't normally like pickle and I I don't like fennel but I love this pickled fennel." That's one of the - I was going to write 'advantages' but it's not really. Let's go with 'features' - that's one of the features of the supper club meal: 'I'd never normally have ordered that but...' People try things. That slight formality and maybe host pressure means things pass from fork to mouth for the first time in decades - often since the youthful aversion was formed. I've had a diner compliment me on the sweet potato mash he'd just finished. "Thanks, but that's roast carrot purée." I replied. "It can't be." He said, "I hate carrots." One man looked almost forlorn after a plate of haddock was eaten. Why? "I've avoided fish for thirty years but that was delicious. What a bloody waste." I think the greatest success has been my (well, Tom Kitchin's) cauliflower purée; dozens have been won over. Including me! I've been wanting to use my newish sous vide machine to make quick pickles. The vacuum process draws the pickling liquor (usually vinegar but also lemon juice here) into the food, resulting in an almost instant effect. I chose fennel to go with one of our classic split menus: fish and baby chicken. Poussin and poisson! Fennel works well with both. I serve them with roast veg and a rich hollandaise so the dish does need some astringency. It would also be a great foil to slow roast pork and crackling. Which is why I'm making more for this weekend. I'm doing a 24 hour roast pork shoulder for a group of ten. 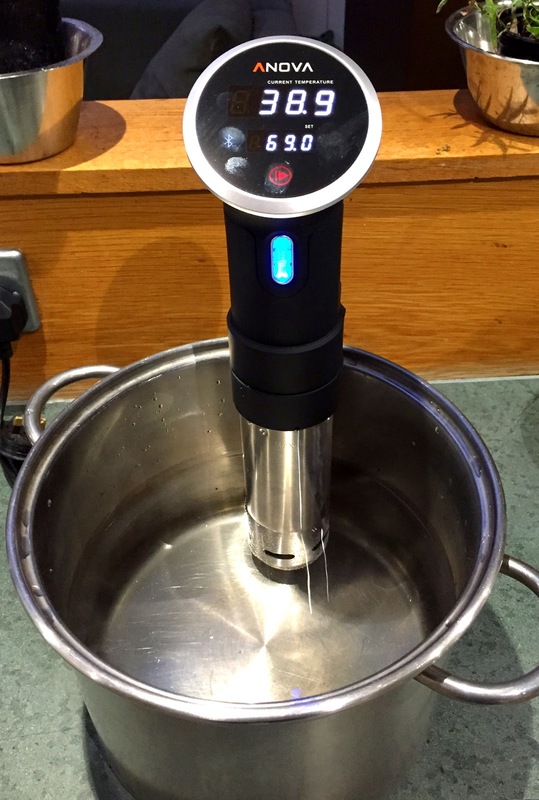 If you don't have a sous vide machine - and, I know, you probably don't. Add the bag of fennel to a pot of boiling water and leave to cool, then refrigerate for at least 24 hours. The results won't be as crisp but they'll still be good. Sous vide is the gentle poaching of food in a temperature controlled water bath, often in vacuum sealed bags. Set your sous vide machine to 82°C. Trim the bottoms and any tough stalks off two fennel bulbs. Cut or mandolin the bulbs into slices of about 5mm. To make the pickling liquor: add 30g of caster sugar to 250ml white wine or cider vinegar along with the juice and zest of one lemon. Add a good pinch of sea salt and a few white peppercorns. You can add whatever aromatic you like of course: pink peppercorns, crushed coriander seeds, bayleaves maybe. Add the sliced fennel and the liquor to a sous vide bag, vacuum and seal. Or place in a ziplock sandwich bag and immerse in water to force out the air before sealing. Cook for 30 minutes. Place bag in an ice bath to fast chill and afterwards transfer to a sealed container. This will keep in the fridge until... well, until you throw it out. Don't you think 'best before' dates on pickles are absurd? It reminds me of the Alan Coren joke - I think of Volvic water: filtered for a million years, best before next Wednesday. Serendipity. Fennel is my wife's favourite vegetable so I've bookmarked this to cook for her at the weekend. Great site, great idea - a totally different league to my Recipe Shed. Oh your shed is quite impressive Keith. A food tardis no less. What did your wife think of the fennel?